NYC to LAX! 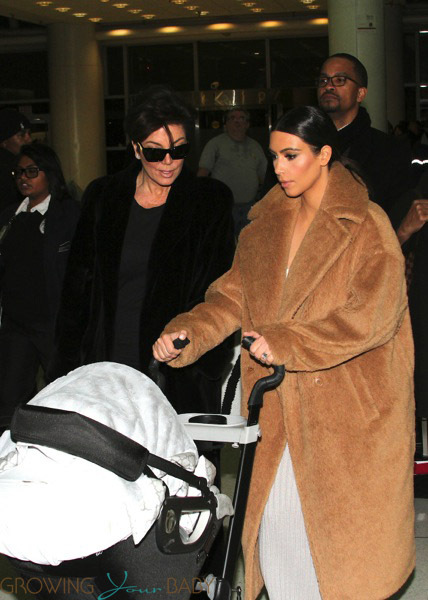 Kim Kardashian and Kris Jenner were spotted checking in at JFK airport with Kim’s daughter North in tow. The ladies arrived at the busy airport with bodyguards, and were photographed waiting in line to go through security before boarding a flight to Los Angeles. In a rare event Kim carried baby North through the airport while pausing every so often to give her kisses. Dressed for the cold New York City weather Kim wore a massive fluffy jacket, while North was bundled in a pink bear themed snow suit. The family has been staying in trendy SoHo, where Kanye has an apartment for the last couple weeks while the rapper finished the North American leg his Yeezus tour. He won’t have much time off as the tour is scheduled to pick up in Australia in May. Kim pushes an Orbit G3 stroller. What the hell is that coat. Hideous and 20 sizes too big.